Cardio Training at Newtown Square Health Club builds heart health. Aerobic exercise and cardio training are at the heart of every physical fitness program. 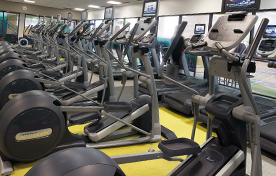 At Ellis Athletic Center in Newtown Square, you’ll find over 50 pieces of Precor equipment in our Cardio Room — each furnished with a personal viewing screen for your enjoyment. The perfect exercise for any weight loss program, cardio training revs your heart rate, burns calories and tones muscles — all while increasing your energy and improving your health. For the ultimate workout, add cardio training to your free weight or functional training routine. Do your heart some good — try us out with a free, 3-day trial membership!